NMSR Science Watch is now going to the Internet Archive!!! PLEASE NOTE: THESE PODCASTS SHOWS ARE NOT LIVE. Science Watch has Wrapped its Run! Listen to Re-Runs of Science Watch on 1350 AM!! Re-runs of the Show are occasionally played on weekends on 1350 AM (Albuquerque metro area). Our regular features: News of the Week, Trivia, Fumbles and Creation Corner. IMPORTANT ANNOUNCEMENT: The End Is HERE! After four years of doing shows every weekend, Dave and Kim are retiring! We're wrapping up the weekly edition of NMSR's Science Watch on March 7, 2010. We may do special shows thereafter (for legislative emergencies or etc. ), but the Weekly Shows are coming to an end! Many thanks to all our sponsors! Marshall Berman, Sandia physicist (retired), former member NM State Board of Education Jesse Johnson, UNM Physics Student/emphasis on Neutrino Reactions, Beer, Horses. Lisa "Fireball" Durkin, Science Teaching Expert. May 21st, 2005 - PILOT ("CREATION WATCH") Listen/Download on the Internet Archive! 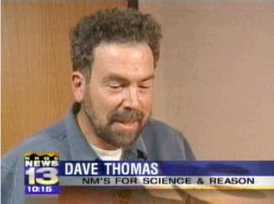 Aug. 13th - Introduction to NMSR's Science Watch Listen/Download on the Internet Archive! August 20th - our exciting second episode! Listen/Download on the Internet Archive! Sept. 10th - "A Dissection of the Intelligent Design Attack on Rio Rancho Science Standards," Kim hosting solo. Sept. 17th - "Scientology, Tom Cruise, Xenu, and Psychiatry." Sept. 24th - "Misuse and Abuse of Probability"
Oct. 1st - special guest geologist John Derr of the USGS, on "Earthquakes and Tsunamis: Like Hurricanes, Easy to Anticipate, Difficult to Predict"
Oct. 8th - "Take It with a Grain of Salt ..." We consider eight stories of the bizarre, and ponder - are they True or False? Kim in-studio, Dave live from Austin, Texas with the Harriet Miers creationism story. Oct. 22nd - "The Bible Code: Data Mining for God." Oct. 29th - "Talking to the Dead: Proof of Ghosts?" Nov. 12th - Albert Einstein's Miracle Year (1905), With Special Guest Tom Schuch from "Einstein: A Stage Portrait." Nov. 19th - no show this week. Nov. 26th - "RELATIVITY- Isn't That Special?" Dec. 3rd - "Ho Ho Ho, UFO's in New Mexico"
Dec. 10th - "NM Science Standards get an A - the Story BEHIND the Story"
Dec. 17th - "Correlation and Causation (To Fiber or not to Fiber: that is the Colon)"
Jan. 7th, 2006: This "The Best and Worst of 2005"
Jan. 14th - "Dinosaurs After the Asteroid?" Jan. 21st (Kim solo, Jesse Johnson guest) "Genetic Algorithms: Learning from Nature"
Jan. 28th (Dave 'n' Kim) "When Science Goes Wrong - What Happens Next?" Feb. 11th (Dave'n'Kim) "Are We Still in Kansas, Toto?" with special in-studio guest Pedro Irigonegaray, Esq. Feb. 18th (Dave'n'Kim) "Hogwarts School of Heredity"
Feb. 25th (Dave'n'Kim) "Was the Apollo Moon Program REAL?" March 11th (Dave'n'Kim) An Hour-long visit with Dr. Alan Hale, co-discoverer of the Hale-Bopp Comet! April 1st (Dave'n'Kim) "The Truth, The Whole Truth, and Nothing BUT the Truth." April 8th: (Dave'n'Kim): "Are we in Rio Rancho Yet, Toto?" April 15th (Dave'n'Kim): "Newton's Second Law of Thermodynamics?" April 22nd: Wolfgang Elston, UNM Vulcanologist, on"Volcanoes In New Mexico." April 29th (Kim'n'Jesse): "Wedding Rings and Hand-me-down Genes"
May 6th (Dave) : "April Holladay's Wonder Quest"
May 13th (Dave'n'Kim): "General Relativity Made Easy (Who are We Trying to Fool?)" May 20th (Dave'n'Kim) : "They Wouldn't Do that to Galileo, Would They?" with guest Dr. Tim Moy, UNM Listen/Download on the Internet Archive! June 17th (Dave'n'Kim) "Do Scientists Ever Get Carried Away (and we don't mean by Aliens, either!)?" July 1st (Kim'n'Jesse): "Creationism Update"
July 7th (Dave'n'Jesse): "Artificial Life in the Blogosphere"
July 15th (Dave'n'Kim) :"Dr. Drought or Mister Monsoon?" with special guest climatologist Dr. Dave Gutzler (UNM Dept. of Earth & Planetary Sciences). July 22nd (Dave'n'Kim): "Back to School: Dover Revisited"
July 29th (Dave'n'Kim): "Stem Cell Research: Where Do We Go Now?" with Lee Anna Cunningham, Ph.D.
August 26th (Dave'n'Kim): "Psst - hey buddy - If you believe that, I've got some cheap land in Florida I want to talk to you about" -- A Visit with Skeptical Inquirer editor Ken Frazier Listen/Download on the Internet Archive! Sept. 9th (Dave'n'Kim): "Magnetic Water Conditioning - Buyer Beware!" Sept. 23rd (Dave'n'Kim): "9-11 Conspiracies"
Sept. 30th (Dave'n'Kim): "Psilly Psychics!" Oct. 7th (Kim'n'Marshall) "So, How Do You Know It's That Old, Anyway?" with geochemist/educator Steve Getty, Ph.D.
Oct. 21st - No Broadcast, technical difficulties. Sorry! Oct. 28th - (Dave'n'Kim): "What the heck is this new Element, Inquirium?!?" with Russ Fisher-Ives from the Intel 2007 International Science & Engineering Fair. Nov. 4th (Dave'n'Kim): An Interview with NM Archaeologist Bill Doleman, currently starring in "Sci Fi Investigates"
Nov. 11th (Dave'n'Kim): "Science gets an A- on its Midterm (Elections)"
Nov. 18th (Kim'n'Jesse): "Here's Something I Just Can't Swallow (Homeopathy)" with Harry Murphy. Nov. 25th (Dave'n'Jesse): "Great Women of Science"
Dec. 2nd (Kim'n'Jesse): "Benjamin Franklin - Ahead of his times." Dec. 9th (Dave'Marshall Berman): "Prayer and Healing - Does It Really Work?" Dec. 16th (Kim'n'Jesse): "I always wave at Quantum Mechanics"
Feb. 10th - No Broadcast, station difficulties. Sorry! Feb. 17th (Dave'n'Kim): "Tales from the Cryptic: The Discovery Institute and More"
Feb. 24th (Kim'n'Marshall) : "One More Time - the FINAL Time, We Hope"
March 3rd (Dave'n'Kim): "Phluster the Physicists"
March 31st (Dave'n'Kim) : "Balder-Science"
May 5th (Kim'n'Marshall): Religion vs. Science: Rules of Engagement with guest Physician/Blogger Burt Humburg, M. D.
May 19th (Kim Johnson, Jesse Johnson & Marshall Berman): "Stump the Physicists #2"
May 26th: Repeat of May 5th Show (Kim'n'Marshall): Religion vs. Science: Rules of Engagement with guest Physician/Blogger Burt Humburg, M. D.
June 2nd (Dave and guest host Dr. Joe Meert), "Creationist Fauna of New Mexico"
June 9th (hosts Kim and Jesse Johnson): Interview with Dr. David Goodstein of Caltech, host of The Mechanical Universe on TV. June 23rd: (Kim Johnson, Jesse Johnson "Stump the Physicists #3"
July 7th: (Marshall Berman and Jesse Johnson): "Law of Attraction - New Age nonsense masquerading as Self-Help." July 14th (Dave and Jesse): "Design Principles in Biology?!?" July 21st (Dave'n'Kim): "Radio Magic!" July 28th (Dave'n'Kim): "A Tribute to Tim Moy"
Aug. 4th (Dave 'n' Kim): "Skeptics - Oh Yeah?" Aug. 11th (Kim'n'Jesse): "Stump the Physicists!?!" Sept. 29th (Kim'n'Jesse): "Stump the Physicists!?!" Oct. 6th (Dave'n'Kim): "Wacky Letters and Food for Thought"
Oct. 13th: (Kim'n'Marshall): "Interview with Cindy Chapman, Teacher/Trainer Extraordinaire"
Oct. 20th: (Kim'n'Marshall): "Creationism: Alive and Lying!" 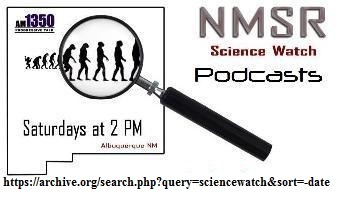 Oct. 27th (Dave'n'Kim): guest Mel Strong of UNM, "The Mysterious Monsoon of New Mexico"
Nov. 3rd (Dave'n'Kim): guest John Fleck of the Albuquerque Journal, "Science, Climate, Counting, and More!" Nov. 10th (Dave'n'Kim): "Story of the Week, and Then Some!" Nov. 17th (Dave'n'Kim): "Inside the Dover ID Trial: Visit with a Witness, Prof. Barbara Forrest" Listen/Download on the Internet Archive! 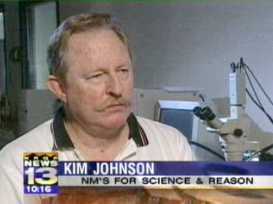 Nov. 24th: repeat airing of Oct. 20th Show, (Kim'n'Marshall): "Creationism: Alive and Lying!" Dec. 8th (Kim 'n' Marshall): "Rio Rancho and the End of 401"
Dec. 15th (Dave'n'Kim): STUMP THE PHYSICISTS. Dec. 22nd, 29th: ON VACATION! Jan. 5th: (Dave'n'Kim): "NMSR's BEST & WORST of 2007!" Jan. 12th (Dave, Kim, and Marshall Berman): "Buckle Up! It's gonna be a bumpy ride! (Creationism in SC, FL & TX)"
Feb. 2nd (Dave'n'Kim): Dr. Ken Miller (of the Brown University Biology Dept.) a ONE-HOUR interview with a key Dover "Intelligent Design" trial witness! Feb. 16th (Kim'n'Jesse) "Science Vignettes." March 1st (Dave'n'Kim): guest Ted Cloak (activist/anthropologist), on "The Trib on the Web? Is There Life After Death? PLUS, It's an Anthropological Potpourri!" March 8th (Dave'n'Kim): "More Science Vignettes, plus Media Fumbles with in-studio guest, Kevin Wellman"
March 15th (Dave'n'Kim) "Sci-Fi, Fantasy, Westerns! A Visit with NM Writer Bob Vardeman, and Kassandra Hrasky of FYF Magazine"
March 29th(Kim'n'Jesse): "Science Fairs and Robots: A Visit with Russ Fisher-Ives"
April 5th (Kim 'n' Marshall): guest Gary Bennett, on "Actually, I AM a Rocket Scientist!" April 12th (Dave'n'Kim): "Mathis Spills the Beans on Expelled!" April 19th (Dave and Marshall): special guest Dee Friesen, on "COSMIC CARNIVAL 2008"
April 26th (Dave and Kim): special guest Bio Professor Dr. Rebecca Reiss, on "Exploring Evolution: the Prequel to Expelled"
May 3rd (Kim & Jesse): "TANSTAAFL"
May 10th (Dave & Kim): "A Visit with NCSE's Genie Scott"
May 17th, repeat of Oct. 20th, 2007: (Kim'n'Marshall): "Creationism: Alive and Lying!" May 24th (Dave'n'Marshall): "Over the Top Archaeology"
May 31st (Dave'n'Kim): "Science Goes to the Movies." June 14th (Dave'n'Jesse) "Bringing Darwin to Life with Brian 'Fox' Ellis..."
July 5th (Marshall'n' Jesse): "Classical Physics and Fig Newtons"
July 12th (Kim 'n' Marshall), on "What's on YOUR Mind?" July 19th (Dave'n'Kim): "Fields of Death"
July 26th (Dave'n'Kim): Guest Larry Crumpler, "The Martian Chronicles"
August 2nd (Dave'n'Kim): "Where do Inches Come From? The Origin of Measuring Units"
August 9th (Dave'n'Kim): "Stump the Physicists, Radioactive Edition"
August 16th (Dave'n'Jesse) "Decrypting Cryptozoology"
September 6th (Kim and Lisa Durkin): "What's Behind Door Number One? Tune in to find out!" September 13th (Kim 'n' Lisa, 'n' Dave on remote): "X's Across Oregon"
September 20th (Dave'n' Jesse): "What's Behind Door Number TWO? Tune in to find out!" September 27th (Dave'n'Kim): "Energy Tips and More: A Visit with Al Zelicoff"
October 4th (Dave'n'Kim):"Sputnik Turns 51: A Visit with Mike Shinabery of the NM Museum of Space History in Alamogordo"
October 11th (Kim 'n' Marshall), on "Siberian Surprise: A Visit with Mark Boslough"
October 18th (Dave 'n' Kim 'n' Marshall), on "What's in a word? Scientific Terminology"
October 25th (Dave 'n' Kim): Interview with Congressional Candidate Martin Heinrich! November 1st (Dave 'n' Lisa): guest Katherine Yuhas, Water Conservation Officer for Bernalillo County, on "Water Issues and New Mexico"
November 8th (Dave'n'Kim): "The Science of Polling"
Nov. 22nd (Dave 'n' Kim 'n' Marshall 'n' Lisa on "Guess Who's Coming to the Roundhouse?" Nov. 29th - no show, alas. Dec. 6th (Dave'n'Kim):"The Age of the Earth:Thousands or Billions of Years?" Jan. 10th (Kim 'n' Jesse): "Best and Worst Awards for 2008!" Jan 17th (Dave 'n' Kim), guest Prof. John Geissman, on "Open Access and the Future of Science Publishing, the Good, the Bad, and the Ugly"
Jan. 24th (Dave'n'Kim'n'Liosa): "Newsweek? New Scientist? Texas? The NM Roundhouse? It's a Creationist Armada!" Jan. 31st (Kim'n'Lisa): guest NM Tech Biology professor Becky Reiss, on "The Human Genome Sequencing Success and what it Means to You"
Feb. 7th (Dave'n'Kim): "The Empire Strikes Back: Attack of the Clones (Legislation-wise)"
Feb. 14th (Dave'n'Kim):"The E-Word: Evolution in New Mexico" with special guests Anne Weaver and George Lawrence! Feb. 21st (Dave'n'Harry Murphy):guest NMT geologist Rick Aster, on "Seismology - A Whole Lotta Shakin' Goin' On!" Feb. 28th (Kim'n'Jesse): "Catching up with Science." March 7th (Dave'n'Kim): "UFO Folks Make An 'Own Goal'!" March 14th (Dave'n'Kim): special guest Prof. Barbara Forrest, on "Statehouse Status: Creationist Legislation Update"
March 21st (Dave'n'Kim): Post Mortem of SB 433, "USE OF SCIENCE IN TEACHING BIOLOGICAL ORIGINS"
March 28th (Dave'n'Kim): "What a Week for Weasels!" Or, "Hard Times for Dennis Lee and William Dembski" with guest Eric Krieg of PHACT. 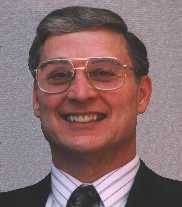 April 11th (Dave'n'Kim): Special guest Russ Fisher-Ives, on "STEM, Science Fair, Academic Athletes and More!" April 18th (Kim'n'Jesse): "Catching up with Neat Science Stories"
April 25th (Kim 'n' Lisa): "Prophesy, Probability, and Expert Opinion"
May 2nd (Dave'n'Kim): Special guest Dr. Al Zelicoff, on "Swine Flu: How Serious is This One?" May 9th (Marshall 'n' Lisa): "The Science of Star Trek: How Are We Doing?" May 16th (Dave 'n' Kim): special guest Mark Boslough, on "Explosions in the Sky: How Dangerous are Asteroids?" May 30th (Dave'n'Kim): "A Problem: How Scientists Communicate With the Public"
June 6th (Dave'n'Kim): "To Debate, Or Not To Debate - That is the Question!" June 20th (Dave'n'Kim): "What do Dinosaurs and Zinc have in Common? We're Talking About Both!" June 27th (Dave'n'Kim): "A Potpourri of Science"
July 4th (Dave'n'Kim) : Repeat of May 20th, 2006 show, "They Wouldn't Do that to Galileo, Would They?" with guest Dr. Tim Moy, UNM Listen/Download on the Internet Archive! July 11th (Kim,Lisa 'n' Jesse): "The PEW Research Poll on Attitudes toward Science"
July 25th (Kim'n'Lisa): "Panic Disorder: It's for Real"
August 1st (Dave'n'Lisa): "Dave's Canadian Adventure: Science in the Coast Mountains of British Columbia"
"The Psychic and the Serial Killer: Examining the 'Best Case' for Psychic Detectives." August 22nd (Kim'n'Lisa): "Science Riddles"
August 29th (Dave 'n' Kim 'n' Jesse): "Toward Objective (And Fair ) Teacher Evaluations"
September 5th(Marshall 'n' Lisa): Repeat of July 18th, 2009 show, on "Benefits of Exercise for the Elderly and Couch Potatoes." September 12th (Dave'n'Kim): Special guest Sister Joan Brown, on "New Mexico Interfaith Power and Light (NMIPL): Recognizing Climate Change Science is an Urgent Moral Issue." September 19th (Dave'n'Lisa): "Fumble-Palooza: a Plethora of Errors, Goofs, and Screw-ups"
September 26th (Dave'n'Kim): "Vaccines and the Common Good"
October 3rd (Dave'n'Kim): "Catching Up on Stories Du Jour"
October 10th (Kim'n'Marshall): "Exponential Growth"
October 17th: repeat of May 30th (Dave'n'Kim): "A Problem: How Scientists Communicate With the Public"
October 24th: Kim 'n' Lisa , with guest Cindy Chapman, on "The Language of Life and Science is in Trouble in the US: Stay Tuned"
October 31st: Kim'n' Dave, with guest Prof. Barbara Forrest, on "What Hath Jindal Done? Scary News from Louisiana"
November 14th, (Dave'n'Lisa): "2012: The END of the WORLD! (NOT)"
November 21st, (Dave'n'Kim): "Again with the Nazis: Godwin's Law Gets No Respect"
November 28th, Repeat of May 20th, 2006: "They Wouldn't Do that to Galileo, Would They?" with guest Dr. Tim Moy, UNM Listen/Download on the Internet Archive! December 5th, (Dave'n'Lisa): "ClimateGate? University of East Anglia? Whassap?" December 19th, (Dave'n'Kim): "BEST AND WORST AWARDS FOR 2009." January 9th (Dave','Kim): "Spinning Science: Catching Governer Ventura in a Lie"
January 16th (Dave'n'Kim): "Haiti Update, Plus Science Potpourri"
January 23rd (Dave'n'Kim): "More Science Potpourri!" January 30th (Dave'n'Kim): guest Mark Boslough (Sandia), on "Defending Planet Earth"
February 6th (Kim'n'Marshall): "What Be Science?" February 13th (Dave'n'Kim): Guest Mark Boslough, on "Hockey Stick Politics: ClimateGate or ClusterPuck?" Listen/Download on the Internet Archive! February 20th (Dave'n'Kim): "Comet Codes in the Bible?" February 27th (Dave'n'Kim): "Chile Earthquake Update (with John Derr of the USGS)"
March 6th (Dave'n'Kim): "The End is HERE!"